The EU has been voicing mixed opinions on Russia. Germany has insisted that sanctions against Moscow “will remain in place,” while other bloc members have united in calls to ease restrictions which they say will be “very dangerous” for the entire world. 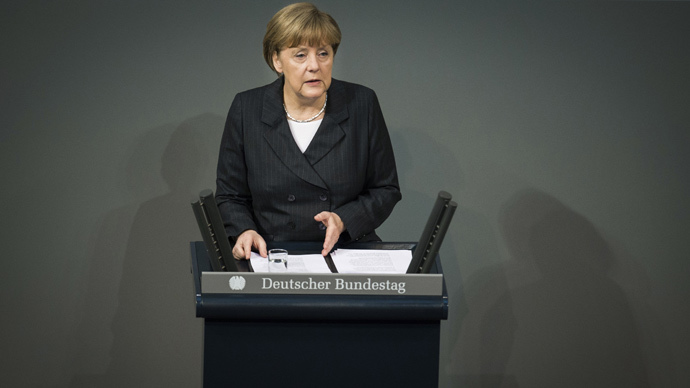 On Thursday, German Chancellor Angela Merkel reiterated her stance that sanctions against Russia cannot yet be lifted. "In spring we will discuss the question how to deal with the sanctions that we decided to impose after Russia's annexation of Crimea," Merkel said. "Given the current situation, they will remain in place." In an interview with Frankfurter Allgemeine Zeitung newspaper, Merkel stressed that “at this point” Russia will not be invited to the June meeting of G7 leaders in Bavaria. “The G7 and former G8 group has always viewed itself as a community of values," the German chancellor said. "The annexation of Crimea, which is a blatant violation of the principles of international law, and the events in eastern Ukraine are serious violations of these common values." However, Merkel did say last week that “fulfilling the entire Minsk agreement” is the condition for sanctions against Russia to be reversed. At the same time, the German chancellor has “little hope” that separate sanctions tied to Crimea could be lifted at all. But there seems to be discord between Merkel’s position towards Moscow and views expressed by other top officials in Germany. "The goal was never to push Russia politically and economically into chaos," Gabriel told Bild am Sonntag newspaper. Other EU officials have also been openly speaking against sanctions on Russia. EU foreign policy chief Federica Mogherini told lawmakers that Brussels must "think of restoring, partially, options and instruments for cooperation on rule of law and the judiciary with Russia." Mogherini’s statement came as the EU Parliament decided to keep sanctions against Russia in place, urging the EU to set certain “benchmarks” for lifting them, which again points to mixed signals from the bloc. “I'm not for the policy of attaining goals by making things worse, I think that sanctions must stop now,” Hollande said during a two-hour interview with France Inter radio on January 5. Hollande’s statement, however, comes amid a Mistral delivery row, with Paris saying it won’t deliver the warships to Russia until the Ukraine crisis is settled. Western allies have been pushing Paris for months, saying that France has to make sacrifices to meet its commitment to oppose Moscow through sanctions over the crisis in Ukraine.